PARENTS EVERYWHERE ARE ASTONISHED BY THE IMPACT MARTIAL ARTS CLASSES IN Newbury Park ARE HAVING ON THEIR CHILD! "Love this studio, the teachers are all super and so great with the kids. They truly care about each and everyone who enters through the door, including the parents. They are great listeners as well, so when you have an issue about your child they will listen and help you teaching your child a life lesson." Our fun and exciting program for 3-5 year olds teaches young students the basics of Tang Soo Do including Respect, Focus and Self-Control. It helps to improve children’s focus and listening skills, self-esteem, and gross motor skills. Students learn self-discipline in a fun, structured program that helps build self-control, balance, fitness and flexibility. We recognize that 3 to 5 year olds have very different developmental needs than their older counterparts, and this program bridges that developmental gap and prepares students for the next level. This program is designed for students ages 5-7. Students in this program will learn basic Life Skills, Coordinations Skills, Character Development, and Basic Martial Arts techniques. Students will learn focus, self-control, respect and classroom manners in a fun, exciting, and dynamic setting! Your children will learn not only to respect others, but to respect themselves as well. 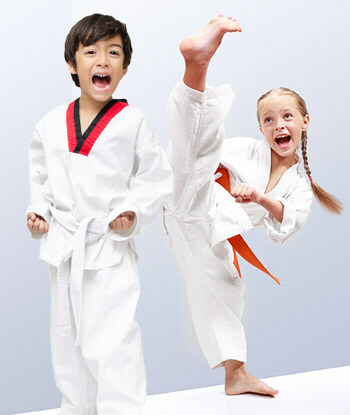 Martial arts is a social experience that pairs your children with likeminded children and adults. It teaches them to interact and work with others. Not only that, it’s incredibly good exercise, keeping your children healthy and happy!